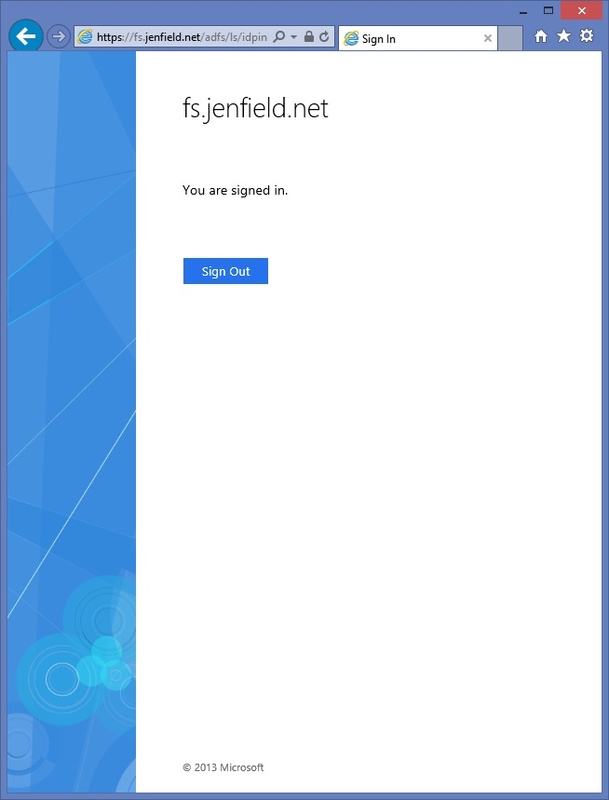 This walkthrough provides instructions for implementing a custom authentication method for AD FS in Windows Server 2012 R2. For more information, see Additional Authentication Methods. The example that you can build here is for educational purposes only. These instructions are for the simplest, most minimal implementation possible to expose the required elements of the model. There is no authentication back end, error processing, or configuration data. The dll is located in %windir%\ADFS on a Windows Server 2012 R2 server on which AD FS has been installed. This dll must be copied to the development machine and an explicit reference created in the project. 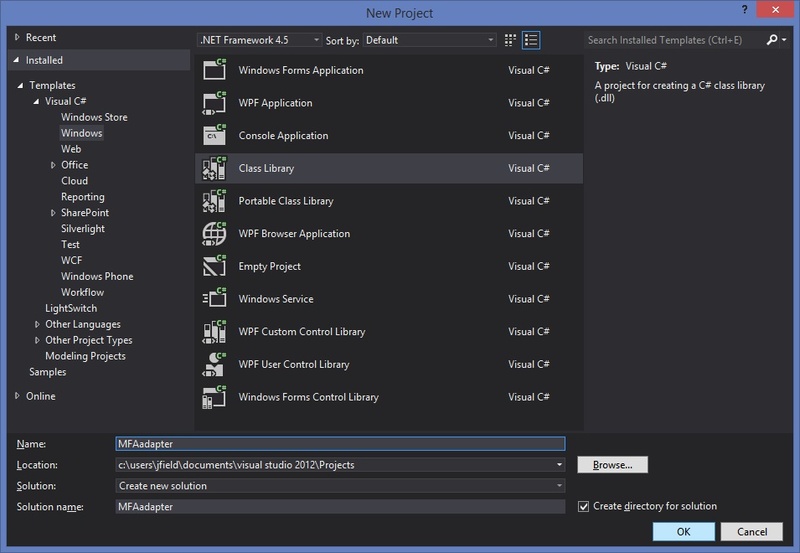 Select Class Library and be sure you are targeting .NET 4.5. Make a copy of Microsoft.IdentityServer.Web.dll from %windir%\ADFS on the Windows Server 2012 R2 server where AD FS has been installed and paste it in your Project folder on your development machine. You should now be set up to resolve all of the types required for the provider. Now you should be able to F12 (right click – Go To Definition) on IAuthenticationAdapter to see the set of required interface members. Next, you can do a simple implementation of these. We are not ready to build yet... there are two more interfaces to go. Add two more classes to your project: one is for the metadata, and the other for the presentation form. You can add these within the same file as the class above. /// one of the methods listed in this property, the authentication attempt will fail. /// to determine the best language\locale to display to the user. /// Returns a Dictionary containing the set of localized friendly names of the provider, indexed by lcid. /// one secondary authentication provider available. /// Returns a Dictionary containing the set of localized descriptions (hover over help) of the provider, indexed by lcid. /// secondary authentication provider available. /// Returns an array indicating the type of claim that that the adapter uses to identify the user being authenticated. /// Note that although the property is an array, only the first element is currently used. //All external providers must return a value of "true" for this property. /// the HEAD section of the presentation form html. Note the ‘todo’ for the Resources.FormPageHtml element above. 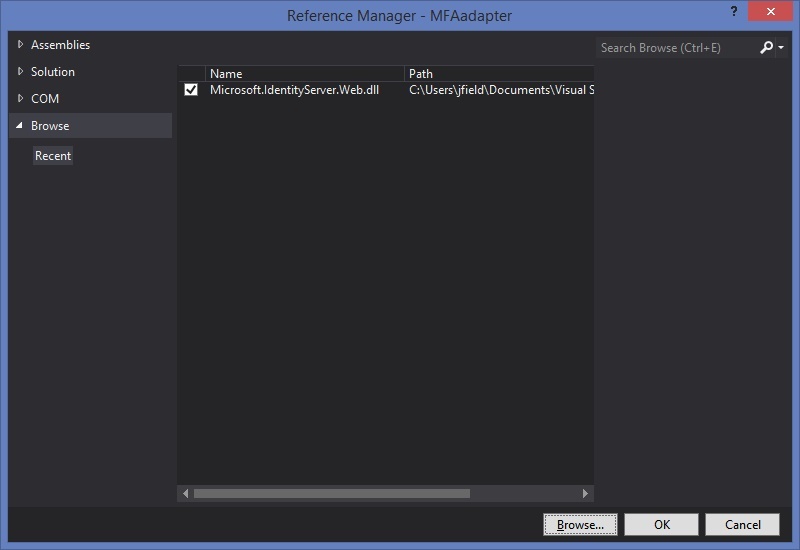 Then, within the Resources.resx file, choose Add Resource...Add existing file. Navigate to the text file (containing the html fragment) that you saved above. You should now be able to build. 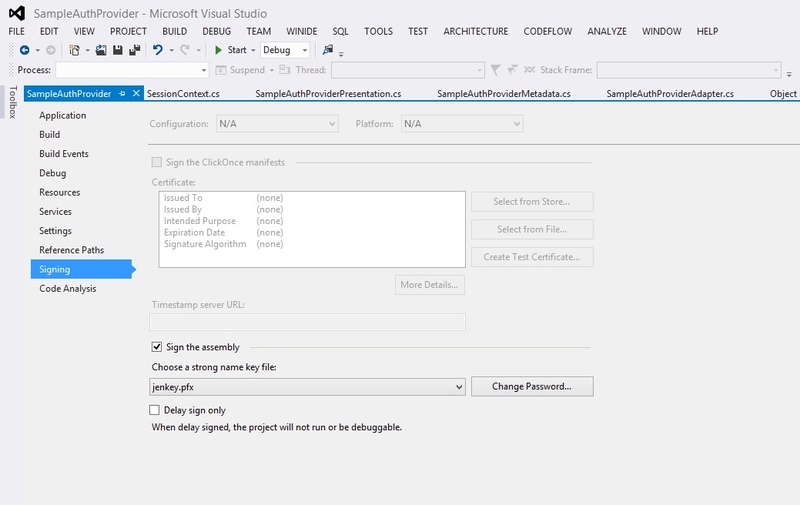 Right click your project name in Solution Explorer and click Properties. Before an external provider can be invoked by AD FS, it must be registered in the system. 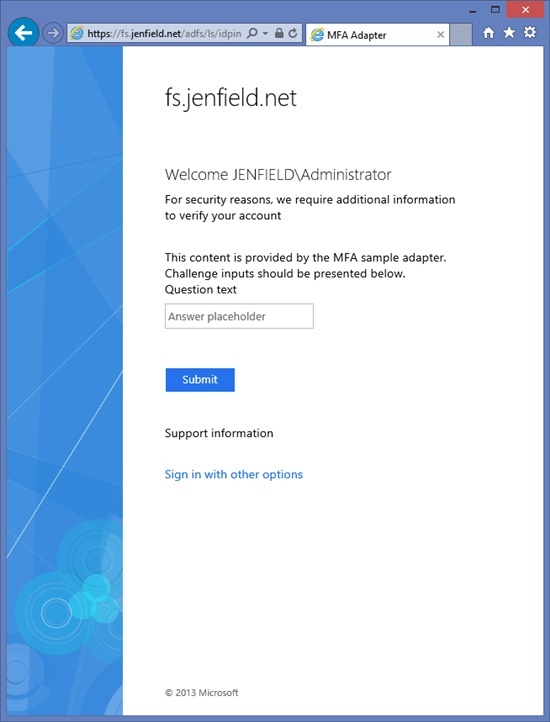 Adapter providers must provide an installer which performs the necessary installation actions including installation in the GAC, and the installer must support registration in AD FS. If that is not done, the administrator needs to execute the Windows PowerShell steps below. These steps can be used in the lab to enable testing and debugging. Copy files and add to GAC. Ensure you have a Windows Server 2012 R2 computer or virtual machine. Install the AD FS role service and configure a farm with at least one node. For detailed steps to setup a federation server in a lab environment, see the Windows Server 2012 R2 AD FS Deployment Guide. Copy the Gacutil.exe tools to the server. Gacutil.exe can be found in %homedrive%\Program Files (x86)\Microsoft SDKs\Windows\v8.0A\bin\NETFX 4.0 Tools\ on a Windows 8 machine. You will need the gacutil.exe file itself as well as the 1033, en-US, and the other localized resource folder below the NETFX 4.0 Tools location. Where YourTypeName is your .NET strong type name: "YourDefaultNamespace.YourIAuthenticationAdapterImplementationClassName, YourAssemblyName, Version=YourAssemblyVersion, Culture=neutral, PublicKeyToken=YourPublicKeyTokenValue, processorArchitecture=MSIL"
This will register your external provider in AD FS, with the Name you provided as AnyNameYouWish above. 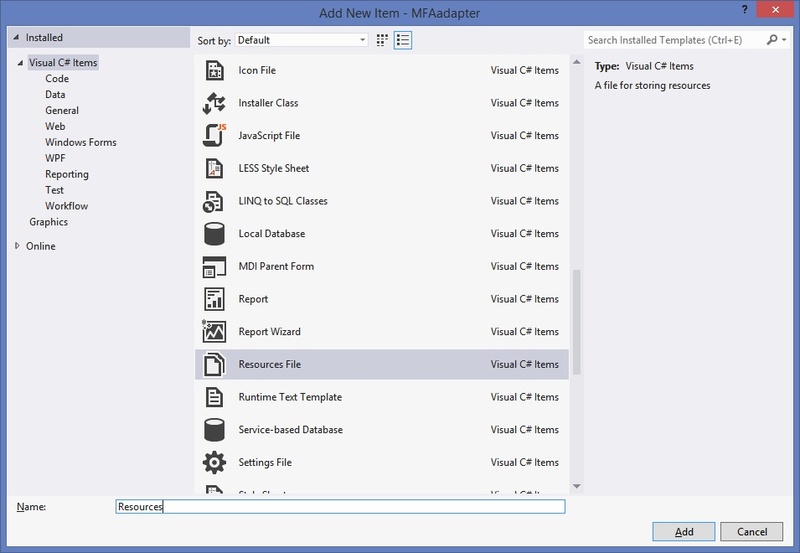 Restart the AD FS service (using the Windows Services snap-in, for example). Run the following command: Get-AdfsAuthenticationProvider. This shows your provider as one of the providers in the system. To verify the registered provider, use the following command:PS C:\>Get-AdfsAuthenticationProvider. Open the AD FS Management snap-in (from the Server Manager Tools menu). In the center pane, under Multi-Factor Authentication, click the Edit link to the right of Global Settings. Under Select additional authentication methods at the bottom of the page, check the box for your provider’s AdminName. Click Apply. First use Get-AdfsGlobalAuthenticationPolicy. You should see your provider Name as one of the AdditionalAuthenticationProvider values. Then use Get-AdfsAdditionalAuthenticationRule. You should see the rules for Extranet and Intranet configured as a result of your policy selection in the administrator UI. Note that the value provided for the AdditionalAuthenticationProvider parameter corresponds to the value you provided for the “Name” parameter in the Register-AdfsAuthenticationProvider cmdlet above and to the “Name” property from Get-AdfsAuthenticationProvider cmdlet output. Example 2: to create MFA rules to require MFA for external requests to a specific relying party. (Note that individual providers cannot be connected to individual relying parties in AD FS in Windows Server 2012 R2). In the AD FS snap-in, under Authentication Policies, in the Primary Authentication area, click Edit next to Global Settings. Or just click the Primary tab from the Multi-factor policy UI. Ensure Forms Authentication is the only option checked for both the Extranet and the Intranet authentication method. Click OK.
Open the IDP initiated sign-on html page (https://<fsname>/adfs/ls/idpinitiatedsignon.htm) and sign in as a valid AD user in your test environment. Enter credentials for primary authentication. You should see the MFA forms page with example challenge questions appear. If you have more than one adapter configured, you will see the MFA choice page with your friendly name from above. You now have a working implementation of the interface and you have the knowledge of how the model works. You can trym as an extra example to set break points in the BeginAuthentication as well as the TryEndAuthentication. Notice how BeginAuthentication is executed when the user first enters the MFA form, whereas TryEndAuthentication is triggered at each Submit of the form. But wait – your example adapter will never successfully authenticate! This is because nothing in your code returns null for TryEndAuthentication. 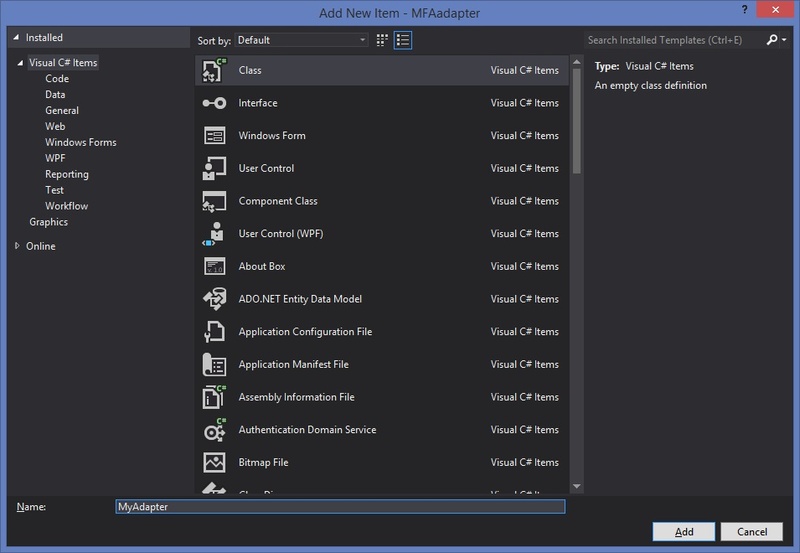 By completing the procedures above, you created a basic adapter implementation and added it to an AD FS server. You can get the MFA forms page, but you cannot yet authenticated because you have not yet put the correct logic in your TryEndAuthentication implementation. So let’s add that. // Return the required authentication method claim, indicating the particulate authentication method used. Now you have to update the adapter on the test box. You must first undo the AD FS policy, then un-register from AD FS and restart AD FS, then remove the .dll from the GAC, then add the new .dll to the GAC, then register it in AD FS, restart AD FS, and re-configure AD FS policy. Clear all MFA related checkboxes in the MFA UI, shown below, then click OK. Note that the value you pass for “Name” is the same value as “Name” you provided to the Register-AdfsAuthenticationProvider cmdlet. It is also the “Name” property that is output from Get-AdfsAuthenticationProvider. Note that the AD FS service must be restarted after this operation. Restart the AD FS service. Under Multi-Factor Authentication, click the Edit link to the right of Global Settings. Under Select additional authentication methods, check the box for your provider’s AdminName. Click Apply. To provide a “trigger” to invoke MFA using your adapter, under Locations check both Extranet and Intranet, for example. Click OK. 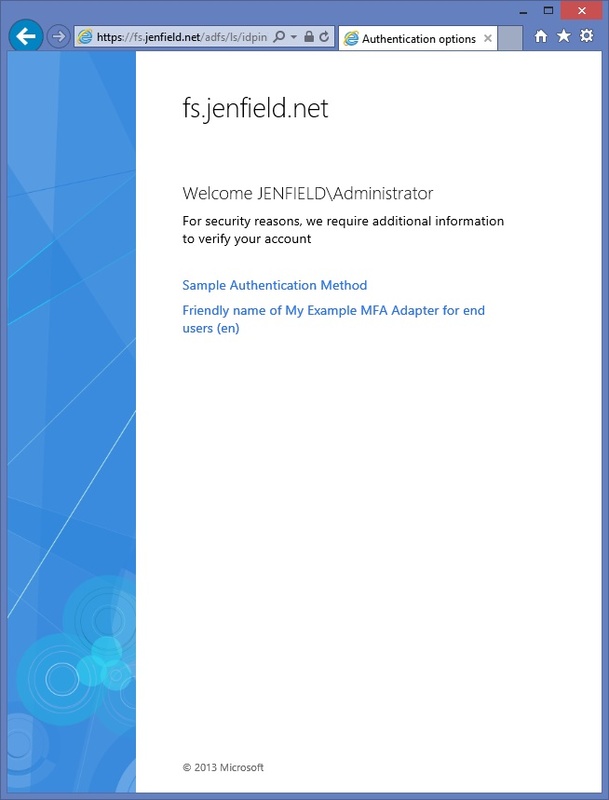 Ensure the AD FS global Primary authentication type is configured as Forms Authentication for both Extranet and Intranet (this makes it easier to authenticate as a specific user). In the AD FS management snap-in, under Authentication Policies, in the Primary Authentication area, click Edit next to Global Settings. Enter the credentials for primary authentication. You should see the MFA forms page with example challenge text appear. 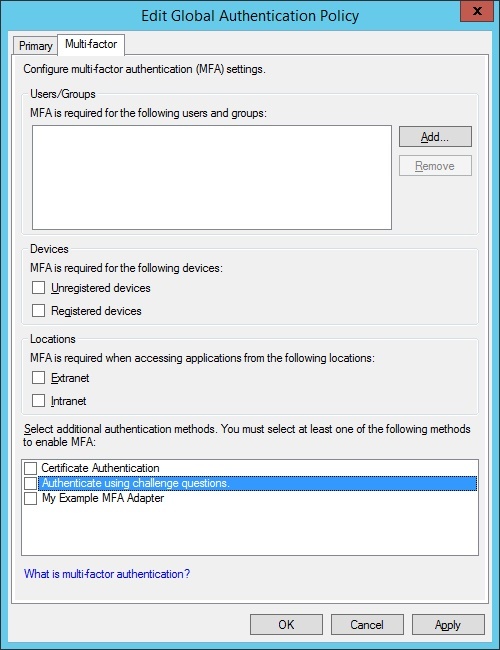 If you have more than one adapter configured, you will see the MFA choice page with your friendly name. You should see a successful sign-in when entering “adfabric” at the MFA authentication page.